The technology show, scheduled for May 12-15 in Orlando, Fla., is rebranding from CardTech/SecurTech to CTST, and it has a new partner.The Smart Card Alliance has joined forces with SourceMedia, CTST’s producer, to manage the show’s content. 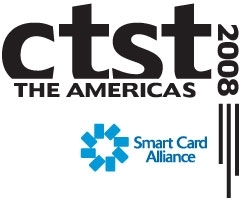 It’s as if the Alliance is returning to its roots, since the CTST conference was originally a joint venture between smart card pioneer Ben Miller, the conference founder and former chairman, and the Smart Card Industry Association, a vendor group that merged with the Smart Card Forum to create the Smart Card Alliance. CTST was founded in 1991 and purchased in 1998 by Faulkner & Gray, now SourceMedia. “We decided the brand name should stay but it’s not just about cards anymore. A lot of great things are happening. People are paying by waving their telephones,” says Dan Rubinetti, vice president of conferences and events at SourceMedia. SourceMedia’s conference group produces 50 to 70 conferences a year but it is also a large business-to-business media company, publishing more than 30 trade publications, including Cards & Payments. The New York-based publisher also produces email newsletters, web seminars, and virtual trade shows. Do you have an exciting new product offering? Do you want to discuss the future of the industry and your company’s role? re:ID and AVISIAN Publishing are proud to serve as the official video partner for CTST 2008. Our team will be on the show floor capturing the action in streaming video and audio formats – to be broadcast online at SecureIDNews.com, ContactlessNews.com, and other AVISIAN publications. Contact us for more information and to schedule an interview slot during the show. We’re looking forward to introducing an new, exciting element to the CTST experience. Under the partnership, which will be active for at least two years, the Alliance will control the program content and will support the marketing and exhibition portion of the conference, says Vanderhoof. SCA’s 180 member organizations representing some 1,300 people will receive a 10% discount on exhibition space, sponsorships and a registration discount, says Vanderhoof. The rest of the CTST makeover comes in the way the conference is laid out this year, and in its name, says Rubinetti. Officially, the conference is listed as CTST The Americas 2008, to incorporate both North America, including Canada and Mexico, and Latin America, where the Alliance also is active. Listening to Vanderhoof explain what’s on tap in May, it appears the hardest decision is what to attend. The conference’s overall theme is the future of payments and security, which have been the two primary drivers in the industry, says Vanderhoof. The conference will be laid out in four major tracks covering identification and policy, payments and applications, mobile and NFC and security and access control. Two “mini-tracks” will highlight emerging technologies and Latin American innovations. In security and access control, the track will investigate the deployment of physical and logical security both in government and enterprise markets, he adds. “We’re including some of the changes in technology around different forms of radio frequency, access control, PKI, and some of the new standards developing,” Vanderhoof says. For those who want to understand the cutting edge technologies that are leading to new developments, this mini-track would be for them. So why should someone attend? “One of the cool things is that you’ll have your choice of these different tracks. You can create your own conference experience. If we can bring them that good solid content, show them best practices people will come away with a good knowledge of what’s out there,” adds Rubinetti. Keynote speaker will be New York Times technology columnist and Emmy-winning CBS News correspondent David Pogue, who will speak at the CTST luncheon May 14. There will also be keynote executive roundtable sessions each of the conference’s three days, says Vanderhoof. “The first day is on the future of smart cards. Executives from each of the four major smart card companies – Oberthur, Giesecke & Devrient, INSIDE Contactless and Gemalto – will answer questions on how each of the vertical markets – transit, payments government identity and security and mobile – are adopting smart cards differently,” he adds. The second day roundtable will focus on the future of payments and how the ecosystem is evolving. That session will feature speakers from MasterCard Worldwide, Verifone, First Data Corp. and Monitise Americas, says Vanderhoof. These three sessions are free to everyone at the conference, he adds, as is the Smart Card Alliance networking reception on May 12. “At this event, we’ll announce the winners of our Outstanding Smart Card Achievement awards. Three OSCAs will be issued: one for individual leadership, another for issuing organization and a third for outstanding supplier. CTST 2008 will feature an expanded and revamped exhibit hall. Last year there were 122 exhibitors but more are expected this year. “We’ve certainly got space for plenty,” Rubinetti says of the Orlando Convention Center. SCA will have its own exhibit space, “where we’re going to have presentations from each of our industry councils on display,” says Vanderhoof. There also will be three pre-conference day-long workshops on May 11 at the convention center. The first will cover technology and payments applications and is sponsored by the Smart Card Alliance; The GlobalPlatform Value Proposition for Identity Management and a seminar on the Open Authentication Architecture for the Universal Adoption Of Strong Authentication, sponsored by the Open Authentication Initiative, rounds out the pre-conference sessions. Conference attendees will also have a chance to win a two-year lease on a Mercedes SLK, a contest sponsored by Infineon. CTST’s largest sponsor is Oberthur, which is handling the registration area. In addition, G&D will have a pavilion that will give those with exhibit hall-only passes, rather than those with a full registration, a taste of the CTST education sessions. “It will be set up like a mini-auditorium on the exhibit floor. Anyone with access to the exhibit hall can sit and enjoy these sessions on different topics. Our technology tours of the exhibit area will also begin there,” says Rubinetti. For more information and to register go to www.ctst.com.